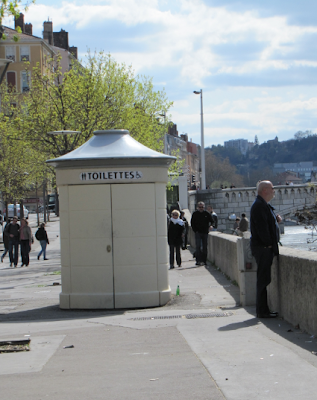 Inspired to create a map of the free public restrooms in Lyon. It probably doesn't take much imagination to figure out what pressing need inspired me. (I'll give you a hint - how many of the past posts had to do with walking around the city for hours? Oh, and cafés.) Unfortunately I did not follow my own rule: have a plan P.
My personal favorite is located in Vieux Lyon near the métro entrance. It's open during the day, is always clean, rarely has a line and (ftw) has TP. The one at Bellecour, behind the Tourism Office, is in a more practical location. However, ladies who prefer to sit rather than squat will want to avoid the Turkish toilet option. Also, while the facilities are free, it is polite to tip the dame pipi who keeps the place clean(ish). My friend Meg recommends stopping by FNAC on rue de la République. It costs 25 centimes, but as she says, "Better to pay a quarter for a clean bathroom than to be obligated to buy something at a café." Good point. On that note, there are pay-potties across the city. They are generally cleaner than the freebies, but you'll need exact change (usually 25 centimes). One last bit of advice: carry a pack of tissues and hand sanitizer. You just never know. Any locations to add or update on the map? E-mail me Other suggestions for people working on their Plan P? Leave a comment below. Found: Dr Pepper at Marché U!